Photos don’t do them justice. 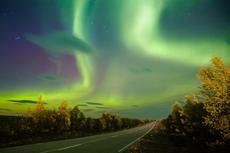 There is no natural phenomenon like the colorful displays of the Aurora Borealis. The bright dancing lights are actually collisions between electrically charged particles from the Sun that enter the Earth’s atmosphere, according to the Northern Lights Centre. The marvel appears in many shades but pale green and pink are the most common. Hues of red, yellow, green, blue, and violet have been reported in certain places, including in Pennsylvania. This was predicted to be the last year to see the Northern Lights for another 11 years. We are at the beginning of the cycle which means that solar eruptions are less frequent. They can still happen anytime, creating a powerful aurora, but they are unpredictable. Many visitors go on guided tours as opposed to drives by themselves to make sure they don’t miss anything. The viewing season usually lasts until March or mid-April. The best conditions include clear and cloudless skies in places with very little light, ideally where nights are uninterrupted for weeks. That’s why most of the perfect locations for nature’s most extraordinary light show are in the snowy, Arctic wilderness. People in places situated in far-northern latitudes are most likely to catch the show. However, you may not have to go as far away as you think.